(15/P92) TRENTON – In its ongoing efforts to protect the ecological health of Barnegat Bay, the Department of Environmental Protection today launched a pilot project to demonstrate simple steps waterfront property owners can take to help reduce populations of sea nettles, a type of stinging and highly predatory jellyfish that can diminish recreational enjoyment of the bay and create ecological imbalance. 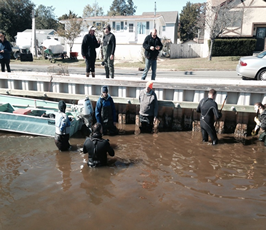 The Barnegat Bay Bulkhead Blitz effort, held in the Silverton section of Toms River, is designed to educate those with docks and bulkheads that helping to keep stinging sea nettles in check is as simple as periodically scrubbing or power-washing the speck-sized polyps that adhere themselves to hard surfaces. These polyps then spawn into buds, which are released into the water in the spring and grow to become sea nettles in the summer. The first-ever Bulkhead Blitz was conceived after the DEP reviewed the results of a three-year DEP-funded research study about the presence of sea nettles in Barnegat Bay as part of the Christie Administration’s comprehensive action plan to address the bay’s ecological health. Scrubbing the nettles off hard surfaces at this time of year prevents their full development for the next summer season and help curtail their spread to other parts of the bay. Property owners in lagoon communities are encouraged to remove floating docks during the winter or clean them using a non-wire scrub brush or by powerwashing manmade bulkheads and docks at and below the high tide line to remove sea nettles. Detergents or other cleansers are not necessary during the scrubbing process. While today’s blitz occurred in Toms River, the DEP plans to eventually expand educational efforts to other areas of Barnegat Bay with high concentrations of polyps.